The Best Western Peppertree Liberty Lake Inn invites you to relax and enjoy one of our all mini-suite guest rooms. Each of our spacious 76 mini-suites has a separate sitting/work area complete with lavish amenities and wireless internet. Guests can enjoy the indoor pool, spa and fitness center and start start their day with our complimentary deluxe breakfast buffet. Our hotel also offers several meeting rooms for the business traveler - The Executive Board Room, The Liberty Lake room and The Peppertree Breakfast Room. 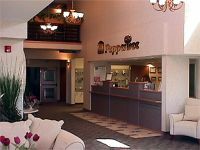 Location: Just off Interstate 90, The Best Western Peppertree Liberty Lake Inn is in the new city of Liberty Lake. Only minutes from the county's number one rated golf course, skating rinks, softball and soccer fields, shopping, dining, theaters and many major high-tech companies. Located 12 miles east of downtown Spokane.